May 17 - Today was the making of history. 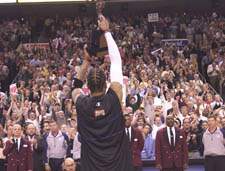 David Stern handed Allen Iverson the MVP trophy at the pregame ceremony. Allen paid tribute to all those who have helped him get to him where he's at, especially the fans. Iverson played the game as if he was proving to the world that he truly deserved the award, scoring an amazing 52 points as the Sixers blowout the Raptors 121-88. Iverson became the second player next to Michael Jordan to have two 50-point games in a series. He finished 21-for-32, including 8-for-14 from beyond the arc. In response to Vince's hot game 3, where Vince said the basket looked like a lake, Iverson said, "to me, (the basket) looked like an ocean".